Whilst staff on the Claims Development Framework fall outside the annual pay review, Unite in AXA did include an element pertaining to them in the 2019 pay claim. We were concerned that, for a variety of reasons, a number of staff on the Framework had not received any pay rise for a number of years, despite their performance being rated as Satisfactory or higher for performance management (which if they had been on the normal performance related pay matrix would have seen them receive pay rises). With this in mind we requested that any employee on the framework who had not received a pay rise in the previous three or more reviews, and had a performance management rating of Satisfactory or higher, receive a pay rise this year. After reviewing the Development Framework population AXA Insurance Claims have agreed to do this and eighteen employees will now see their pay increased this month when they otherwise would not have. AXA’s announcement today in respect of changes to its Commercial Lines Intermediary operation comes with the disappointing news that 106 jobs have been put at risk as part of the process. Unite has been involved in ongoing consultation with the company about the changes and is confident that many staff who have been put at risk will be able to be relocated into new roles and the number of redundancies will be much reduced. We do appreciate however that being put at risk is not nice and would encourage members to engage with their local reps on issues of concern. If you do not have a Unite rep in your branch, please look at the list of reps here see who to contact. Thank you to everyone who voted and the local workplace reps for the hard work they put in running the ballot. Unite in AXA have approached the company with a view to addressing the banked redundancy terms anomaly affecting ex-Prospero/AXA Direct staff. When AXA Insurance terms and conditions where harmonised in 2001 for staff from the various companies including Guardian, Provincial and Prospero, the banking of redundancy terms, a move taken to protect previously earned benefits, resulted in the small ex-Prospero/AXA Direct population banking redundancy terms worse than those going forward. We have opened discussions with AXA Insurance about removing this anomaly to ensure this small group of employees do not continue to be penalised for having an employment history different than the majority of their colleagues. This statement tells you the overall pay budget (how much AXA has to spend on salaries) and framework (how AXA will spend it) for 2019. This is negotiated between AXA and Unite for Associate to Professional bands and applies to all AXA Insurance and Corporate Centre employees. This year’s talks have concluded with an offer of a 3% increase for the total pay budget for employees in Associate to Professional bands. The same budget will apply to the Senior Professional to Senior Leader bands. Whilst the overall increase to the budget will be shared across all eligible employees, individual increases will vary based on the circumstances set out below. Any pay increases will take effect from 1 April 2019. Pay awards will be made to employees in these roles based on performance rating and position of salary in the pay range. The % amounts are set in order to be able to make larger awards to high performers and those lower in the pay ranges, while also remaining within the overall budget. Individual outcomes will be formally communicated to employees in March. Further information about how pay is distributed using the matrix can be found on the Manager Area on ONE. Managers who are responsible for pay decisions for the pay review process (also known as Pool Heads) will have full discretion to set pay awards within the overall budget for employees in Senior Professional to Senior Leader roles. These decisions are made in the context of a range factors including individual performance, the external market and comparable pay between peers. Following the recent changes made to AXA’s bands and pay ranges, it has been decided that Professionals will move into the discretionary approach (currently applied to Senior Professionals and above) for pay and bonus awards paid next year (2020). In implementing this change AXA will pay particular attention to ensuring fairness remains at the forefront of pay and bonus decisions and, as with any change, the approach will be subject to review to ensure it is meeting the objectives that have been set down for it. AXA UK’s minimum salary will be increased to £16,380 (based on a 35 hour FTE contract). There are no other changes to pay ranges. There are some local pay arrangements, like the AXA Insurance Claims Development Framework, which are managed outside of this process. There’s more information on the pay review process on the My Pay & Benefits pages on ONE. Unite will ballot its members on this offer, with the ballot taking place between the 11th and 20thFebruary. Please speak to your line manager or Unite representative if you have any questions. As many members working in Claims will know, the Development Framework designed to advance staff more quickly though their pay scale than the performance related pay system has more than a few problems and is not working as it should be. We have been engaging the company on this topic for some time now and have agreed to commence a full scale review in the second quarter of this year. At present individual disciplines within Claims eg. liability, motor etc. are reviewing that skills they regard as necessary for an employee to be rated as competent and be able to handle the bulk of items that cross their desk. Cleary this is not going to be a swift fix, but we are hopeful that we can help ensure the necessary changes are put in place to ensure the Development Framework system works as it should do (ie. to the benefit of the staff and company) and not as it has been. Unite the Union met with representatives of AXA today and submitted a 3.5% pay claim on behalf of the bargaining unit. Further negotiation meetings have been scheduled for this month. 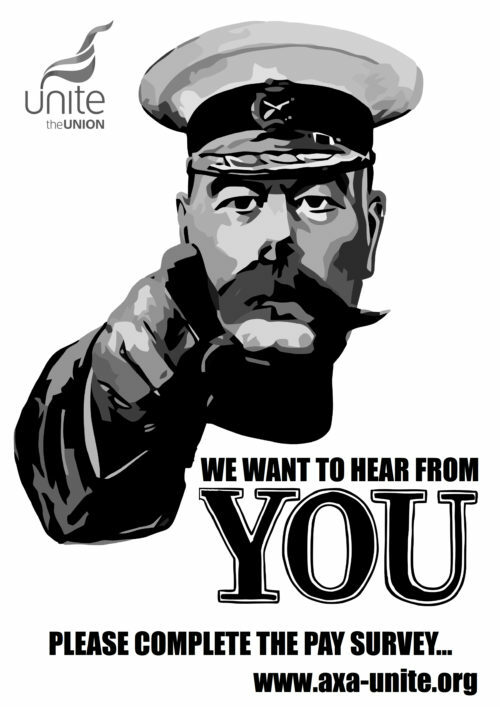 The 2019 Unite in AXA pay survey can be accessed here. Today Unite in AXA commences balloting its members in Northern Ireland in respect of the company proposals on pay and reward for staff in Belfast, Derry and the Northern Ireland branches, negotiated after a series of meetings this year. As members in Northern Ireland appreciate there were many concerns about pay and reward especially market competitiveness that needed addressing. We have discussed these at length with the company and the end result is a proposal we believe addresses almost all of these issues resulting in substantial pay rises for the vast majority of staff. Unfortunately a small number of benefits and current practices have had to be changed due to regulatory requirements or employment law, however we feel AXA has been reasonable in the alternatives proposed to address these necessary changes. Overall the company proposal addresses almost all of the concerns that members have raised with us over the last few years and will see the vast majority of staff receiving substantial improvements in their current levels of pay and reward. Additionally the introduction of a new grading system (part of a global process driven by AXA Head Office Paris and being rolled out across the group) will now enable staff in Derry to enjoy the benefits of career development previously unavailable to them. The ballot commences today and will run until noon on Tuesday 29th May. If you have any questions please speak to your local Unite in AXA rep. Copyright © 2018 Unite in AXA. Powered by WordPress and A Dream to Host theme by Art of Blog.